Welcome to your 30s! There are a few more candles on your birthday cake now, but each one of those candles represents knowledge, experience, and wisdom gained. At this point in your life you probably aren’t scrimping to get by like you were in your 20s (whew!). After working hard on the bottom rungs during your 20s, your initiative, motivation, and growing experience have been recognized. You’ve received raises and are now earning a comfortable income. At the same time you are taking home a bigger paycheck each month, you’ve also shouldered more expenses. It’s likely that you’ll be buying your first house in your 30s or at least upgrading from the bachelorette pad you had in your 20s. Speaking of bachelorette, you may find a sparkling engagement ring on your finger during this decade of life and welcome your children into the world. Weddings, mortgages, and children are all expensive, so your bigger paycheck may vanish quickly. Even though you have a lot of financial responsibilities in your 30s, now is not the time to cut back on saving for retirement. Now, you may finally be in a position to regularly contribute to your retirement fund and earn matching contributions from your employer. You are still early in your retirement journey, which means every cent you put away can grow in a big way with a few decades and the power of compound interest. Remember the trick you learned in our first article in this series? Don’t just save the same amount year after year. Instead, commit to saving a specific percentage of your income, which means saving more as your income increases. When you automate these deductions, you won’t even notice the difference when you get a raise. You’ll still be taking home a little bit of extra money and saving more money at the same time! In your 30s, it’s time to get serious about considering your retirement. What do you want your retirement to look like? What type of lifestyle do you want to maintain? Retirement is still a ways in the distance, but it’s time to at least attach a rough price tag. When you’ve got a target in mind, you can work backward to figure out how much you need to be putting away today in order to make your future retirement dream come true. It can be difficult to figure out how much you should be saving in order to achieve the retirement you want or even what investment vehicles to use. Is the stock market too risky? Will you ever save enough if you just invest in bonds? Now might be the time to reach out to a financial advisor to help you create a sound investment plan for your future. Just make sure you understand how your financial advisor earns his or her paycheck. Are they paid on commission? If so, you need to recognize that their investment suggestions might be financially motivated. If they work for an upfront fee or a percentage of your portfolio, then make sure you understand what that fee is and determine if you are willing to pay the price for expert advice. Life can be busy in your 30s, but don’t ever forget about your retirement account. This decade of your life should be all about growth, growth, growth. If possible, avoid taking disbursements out of your retirement account, even if you can do so without penalty in certain circumstances such as buying your first home or coping with financial hardship. Leave that money alone, so it can keep growing for you. 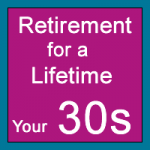 Learn even more about retirement from our retirement article archive just for women.